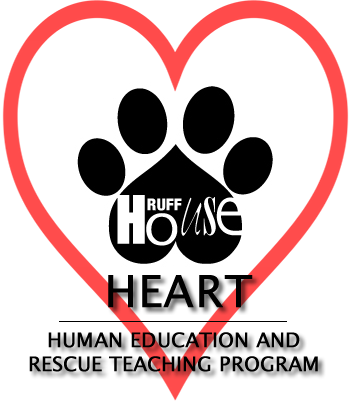 Ruff House Rescue’s HEART Program provides workshops to local schools and youth groups. Our primary focus is to present interactive information to pre-school, elementary and middle school students. We also work with local high schools for community service for their students and have been instrumental in establishing the first Long Island High School Dog Rescue Group at Syosset High School. The mission of our education team is to help children, young adults, and their families become responsible, compassionate and empathetic pet owners by educating them on adoption, rescue, and responsibility. We go directly into schools, meet with local youth organizations such as the girl scouts and eagle scouts. In addition we work one-on-one with families to teach the next generation about the importance of all facets of rescue: spay/neuter, micro-chipping, id tagging, as well as responsible pet ownership. The goal of the program is to influence and educate the younger generation so that today and tomorrow’s youth is more informed of our mission and in turn, someday, there will be fewer homeless pets and more saved lives. Success - you may opt out at any time. Get event notifications and special announcements.